Today is an exciting day for fabricdoorstops.com, 2 mini lops are going to join us soon! A white brother and sister with ginger patches will come to live with us and no doubt will be a great source of inspiration for our website. 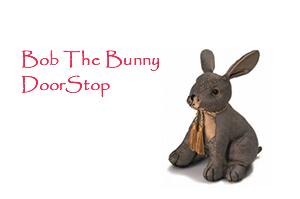 We thought we would take this opportunity to find you the best bunny doorstops! Bob the bunny would be very happy to hold your door open and to watch people walk by without being frightened by any loud noises. He’s made from soft brocade and there is satin on his ears, chest and bobtail. Filled with sand, he is a doorstop weighing 1Kg (approx). Bob wears a very fetching satin tassel and has hand stitched nose and paws.